Bill Smith. I make handcrafted olive oil-based bar soaps and shave soaps. I have been making soaps for almost 20 years and have been selling my soaps since 2009. I have been many things in my life; engineer, chemist, sculptor, librarian, and more, and being a soapmaker is the most enjoyable thing I have done because I get to use many of my interests and talents. What’s the latest thing you’ve been working on? I’m working on developing a shampoo bar soap formula and a jewelweed soap for poison ivy relief. I spent four years developing a shave soap formulation I was happy with, and ten years for the bar soap formulation I use. Shampoo bars are challenging because there are many factors to consider and balance. Will you be featuring any special holiday items? I have several bars that are scented intentionally for the holidays. Orange Clove, Peppermint Vanilla, Frozen, Balsam, Holiday Berries and Frankincense & Myrrh. I will likely also have a holiday sampler set of six half-bars wrapped in ribbon which will make wonderful gifts. What was your first memory of making something? My parents (a machinist and knitter and wonderful cook) always encouraged all five of their kids to use their hands. The first thing I remember making is a scrap-wood fort in the middle of their driveway. The neighbors were not happy with a kid’s eyesore, but it was recycled pretty quickly into more projects. What do your customers love most about your product(s)? My customers give my soaps rave reviews for the way it leaves their skin feeling when they use it and the scents I use. Many people tell me how much they love my soaps because their skin is moisturized and not dry and the bars are silky smooth with great lather. Have you always been passionate about art and design? Yes. I am trained as an engineer because I love to design and make things. While studying engineering, I also studied art history, ceramics, and sculpture. I have studied and practiced various arts since I was a child. Meeting hundreds of people and having a chat with many of them. Those that I have met before at previous craft shows often become repeat customers and friends. It makes me happy to make others happy. Soapmaking is my full-time occupation and has been for about five years now. I sell at about twenty craft shows each year and supply a number of stores in Minnesota with soaps. I also ship soaps all over the United States to repeat customers. My wife convinced me to sell soap when her office told her they wanted to by my soaps because they loved them instead of get them for free. I had been giving every member of her office soaps, as well as friends and family, to the tune of about 100 pounds of soap each year so I could make more. I made way more soap than I can personally, and I keep wanting to make more. My soapmaking is a hobby gone wild. Why did you start working in this particular craft? Commercial soap was unsatisfying to me and made my skin itch. I’m an engineer. I knew I could make better soap and spent 10 years refining my recipes and techniques. What do you think sets your designs apart from others? I use bold colors and bold scents in my soaps. Many handcrafted soaps are rather bland in color and weak in scent, in my opinion. My wife says her opinion is that it’s a reflection of a man making. I also use oils that are better for your skin than many soapmakers. Soap can be made from a lot of different oils, and many soapers choose cheap oils that clean well but strip skin oils and are unsatisfactory in other ways; lather, conditioning, moisturizing. What are some inspirations for your work? I try to make every soap bar design be unique and have a rational relationship between the scent and the color. Scent is the most nostalgic sense, and if a scent calls an image or feeling to my mind, I try to design the bars to reflect that. Curiosity. If a person has curiosity and acts on it they will never be bored. I don’t like being bored and I like to challenge myself. How is X done? Can I do that? Can I do it better? Where did your business name come from? Is there an interesting story behind it? a.m. soap company is named because when I finally created a soap formula that I though was perfect, I got out of the shower telling my wife that it made me happy in the morning and it was a great way to start the day. Our original image was a sunrise over a lake, and our current package highlights a shining sun. What valuable experience/knowledge did you have before starting your business? I have good skills in mathematics, chemistry and formulation and have good lab skills because I have worked professionally as an engineer and a chemist. These skills are important to being able to create beautiful soaps that perform extremely well and satisfy demanding customers. I am also good at creating specialized equipment and tools I might need. What made you take this leap into being your own boss? In 2008 when the economy tanked, I had no employment. I decided that I needed to make my own job if I wasn’t finding one, because doing nothing wasn’t an appealing option. I started this business so that I didn’t sit around unproductively, and so that I would model good behavior for my children. I wanted to show them that we are the masters of our own fate. What are some tips or suggestions you’d like to offer to fellow makers? Don’t take on too much debt. I believe it is better to build slowly on a solid foundation than to saddle oneself in large debt quickly to accomplish growth quickly. Cash flow problems are what ruins most small businesses. It takes time to build a business and relationships with customers, and word of mouth reputation takes time to build. Treat customers well, price fairly and keep price points in mind because customers do. Don’t skimp on materials to increase profits. Customers can tell quality and they appreciate it. Check out more of Bill's products online, and be sure to stop by his booth at the Minneapolis Gift & Art Expo, November 2-4, 2018 at the Minneapolis Convention Center! Patti’s Nuts and Granola is an artisan food company based in south Minneapolis. I hand-make, in small batches, delicious oven-roasted seasoned nuts and granola. Currently, there are two flavors of nuts – rosemary and maple cinnamon and two granola flavors - honey almond and maple pecan. My products are currently sold at farmer’s markets, art and holiday shows, gift baskets, as well at all local Kowalski’s grocery stores. Honestly, I think my customers truly love the unique combination of flavors and that each batch of seasoned nuts and granola is hand-made, packaged and sold by me, using locally sourced ingredients. People love to use the nuts especially for snacking, entertaining, and gifting. They know they are sharing something that they feel is unique and special and most importantly, good for them. The people. I’m a people person so I get energized by all of the people I meet, both customers and other vendors. For customers, I enjoy how much they appreciate the work we vendors put in. I love to talk with them about how my products might fit into their life or special occasion. For vendors, I appreciate their creativity and their hard work. I learn so much from them and hope I’m also able to share a little wisdom. I just love the energy from the people and the events. What’s your favorite item that you sell? It has to be my rosemary nuts. First of all, after four years of making and eating them, I still find them to be addictive, as do my loyal customers. They’re a unique offering. They’re also the product that really advanced my business. They became very popular at farmer’s markets and that’s what really helped me gain the confidence that I could run a successful artisan food business. Patti’s simply started as a way to share my handcrafted, small batch roasted nuts and granola. After years of gifting my food to family and friends, I decided it was time to share them with a broader audience. Local farmer’s markets is where it all began, and now Patti’s products can be found in several Minneapolis grocery and gift stores. I hope you enjoy eating and sharing my flavorful treats as much as I enjoy making them. Check out more of Patti's products online, and be sure to stop by her booth at the Minneapolis Gift & Art Expo, November 2-4, 2018 at the Minneapolis Convention Center! Herbal Alchemy natural skincare products are crafted locally in small batches by Phoebe Nguyen. Phoebe is dedicated to creating the best products possible, and her trail and error has led her to finding the right formulas that make her skincare line work wonders. Phoebe set out to create all-natural skincare products with an emphasis on therapeutic properties, and Herbal Alchemy products have given her customers results that speak for themselves. My name is Phoebe Nguyen, owner of a natural skincare business called Herbal Alchemy LLC. 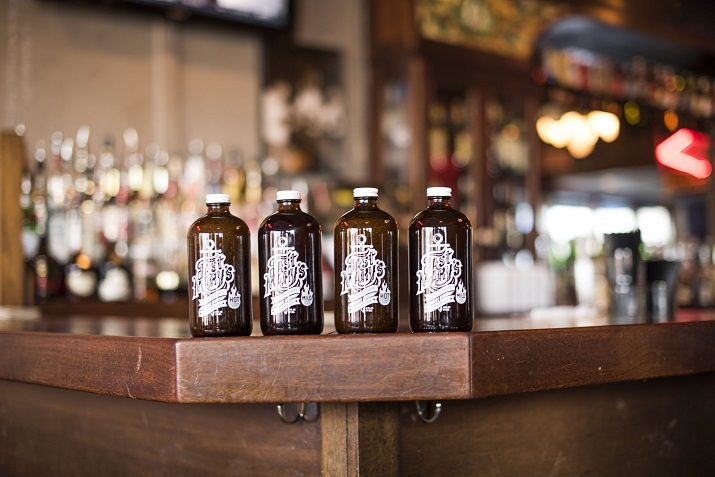 My products are freshly made in small batches, locally here in the Arts District of NE Minneapolis. In addition to offering fine quality ingredients that contribute to a luxurious feel, my products also have an emphasis on the therapeutic effect for various skin conditions. Growing up surrounded by my mother’s jungle medicine and father’s Chinese herbalism, I’ve always been fascinated by the myriad uses of botany that is abundant around us. My own path toward all-natural skincare started in 2000, after my young baby developed hives from a bubble bath. A friend suggested an oatmeal soak. One look at the ingredient list on the package -- plain colloidal oatmeal -- made me realize that I could make better, more pampering products. Have you had any major failures? If so, what were some important insights gained? At first, I read books and made skincare according to the recipes. It was fun and I was happy to share them with my poor mom, who used up everything despite the extreme level of greasiness. Over the years, I gained knowledge of oil properties and experimented with numerous natural ingredients to alleviate different skin conditions, all the while making sure to create products that are quick absorbing and comfortable to put on. The days of greasy moisturizers are over! What has your favorite moment been since starting your business? Despite not being a “mall person,” I’ve really enjoyed opening a shop at Northtown Mall. Meeting and talking to people has been very fulfilling to me, especially when I could help resolve issues that my clients have had for a long time. My absolute favorite part is when they come back to let me see the results. One woman even made me touch her face so that I could feel how soft and supple it is after suffering patches of scabby dryness for years! My customers love how smooth and silky the products feel, upon trying them in-store. However, most would come back excitedly telling me of how they can see and feel a difference after a few days of usage. I’ve been a big believer in the effectiveness of silk peptide, as it promotes production of collagen to make skin feel more firm and heal faster. My customers seem to respond well to this amazing ingredient as well. What’s the latest thing you’re working on? On my latest overseas trip, I asked family there to purchase a type of oil in bulk for me, which I have used in the past as part of a calming recipe for eczema-prone skin. The item brought back was exactly what I was asking for, except that it had another ingredient mixed in -- pharmaceutical grade python fat! Upon a discussion with my mother, I learned that it was a traditional ingredient used for anti-scarring in her native upbringing. Further research shows that it is used on keloid scars, in particular. I am in the process of formulating a cream with this precious, new-yet-ancient ingredient. Check out more about Phoebe's products online, and be sure to stop by her booth at the Minneapolis Gift & Art Expo, November 2-4, 2018 at the Minneapolis Convention Center! Chances are, you've seen Double Take Salsa at your local grocery store, but it hasn't always been that way. Bernie Dahlin started crafting salsa from his own back yard, and the response he got from his simple, homemade batch planted the seed that he could create a business. Years later, he took the leap, and he's grown his business to carry a full line of salsas, hot sauces, and now marinades. You have to sample the flavors for yourself... it will make you do a "Double Take!" My name is Bernie, and I make gourmet Salsas and Hot Sauces. There are a few things that I am really excited about. 1- The launch of Mama Kicks authentic marinades and sauces. 2- getting into my own space to cook so I can continue to grow. Yes, I am in the process of designing and making custom gift boxes. These are going to be great. Colorful, and a good variety for almost anyone you know. They are also going to be very reasonably priced too. I will never get sick of people saying to me “Wow” or “OH GOD that’s good”. People do a ‘double take’ on the intense and beautifully crafted flavors that we created in all of our products. So yeah, the flavor is what people love. I got started by growing tomatoes and habaneros in my back yard. One summer I had way too many tomatoes, so instead of throwing them out, I decided to make some salsa and bring it into the office. The tradition started…. And 7 years later, I finally quit my fulltime job. It was scary but the best thing I have done. What has been your favorite moment since creating your business? This one is EASY…. Even though it is always special and exciting to see someone try my salsa for the first time and look at their friend and say “OMG that is the BEST SALSA EVER”, the best moment was when I walked into Linden Hills Co-op and saw my products on the shelf for the first time. I think I shed a tear. Decide/ make a plan on what you want your business to become. That way you can get there. If you want to go big, you are going to have to work REALLY hard and many times not get compensated for a long time. It’s been over three years, and I still haven’t paid myself. Also, you will need thick skin as some people will be verbal on how much they don’t like your product, also there will be other tough times where you feel like giving up. STAY WITH IT!!! Check out more about Bernie's products online, and be sure to stop by his booth at the Minneapolis Gift & Art Expo, November 2-4, 2018 at the Minneapolis Convention Center! Ashley Andrighetti of Handmade Love creates one-of-a-kind precious metal and natural crystal jewelry using her skills in metalsmithing and electroforming. Her years of experience in many facets of art and design have culminated in Ashley finding her true artistic passion for jewelry design and fabrication. Ashley puts her heart into each piece— her business is aptly named Handmade Love— and she loves helping customers find a piece that speaks to them. My name is Ashley Andrighetti. I am a mother of a 4yr old boy, 3 crazy dogs and am a military wife. I am a jewelry designer and artist focusing on precious metals and a wide variety or natural crystals. Everything I make is one of a kind and completely hand made. Since my products use naturally occurring crystals and each crystal has a different energy and attributes, customers are able to find specific pieces that speak directly to them and their needs. When they get my pieces they love that they have have a completely unique design that is different than anything else; no two of my pieces are the same. Yes, for as long as I can remember I have loved all forms of art, from fashion and jewelry to paintings and photography. In college I majored in art and studied abroad on several occasions. After college I began in photography and lampworking, making glass beads using a torch. That led me down a path of progression to reach my passion which is metalsmithing and electroforming. Through each stage of life my love and passion for art has only grown. What is your favorite item you sell? My favorite items that I sell are my rings. Through all of my other forms of art I could not make rings, so when I started doing electroforming and metalsmithing I finally could and I went a little ring crazy. I love each ring I make and put a little part of myself into each one. I would love to keep them all myself, so know that each one is special. It is something inside of me, like an itch. When it starts I need to create something or I’ll go crazy. Often I find myself waking up at night with an idea or design and I can’t sleep after that because I’m so excited to make something new and unique. My passion for art and love of what I do motivates me to create. Check out more about Ashley's work online, and be sure to stop by her booth at the Minneapolis Gift & Art Expo, November 2-4, 2018 at the Minneapolis Convention Center! Wendi Winkler is the Urban Chemist, the creator of a special Bloody Mary drink enhancer, Fast Mary's. Her passion for inventing new things and her work as a chemist led Wendi on her mission to make a better tasting Bloody Mary. 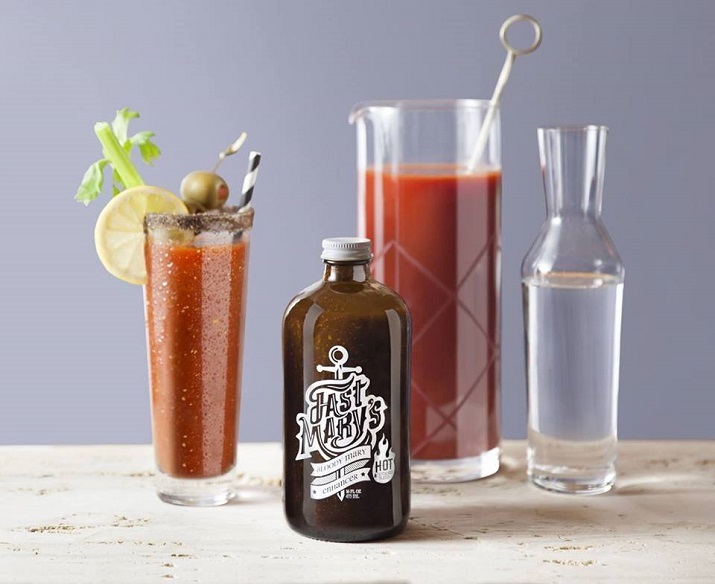 Her two formulas, Mild and Hot, can be mixed into plain tomato juice for a customized Bloody Mary to suit all tastes. Top it off with your favorite garnishes (we suggest cheese and pickles!) and Fast Mary's Bloody Mary Enhancer will be your go-to brunch favorite. 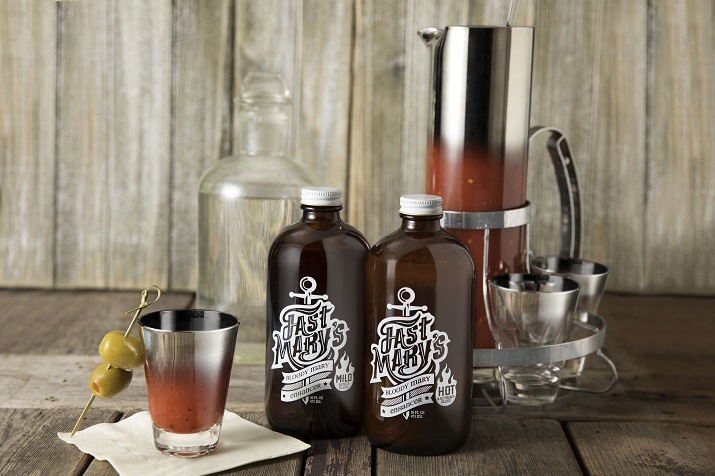 My name is Wendi Winkler, owner of Urban Chemist LLC and maker of Fast Mary’s Bloody Mary Enhancer. I am a chemist, by profession, but have always had a passion for making excellent Bloody Mary’s. We will be featuring a holiday gift box, which includes two 8 oz. 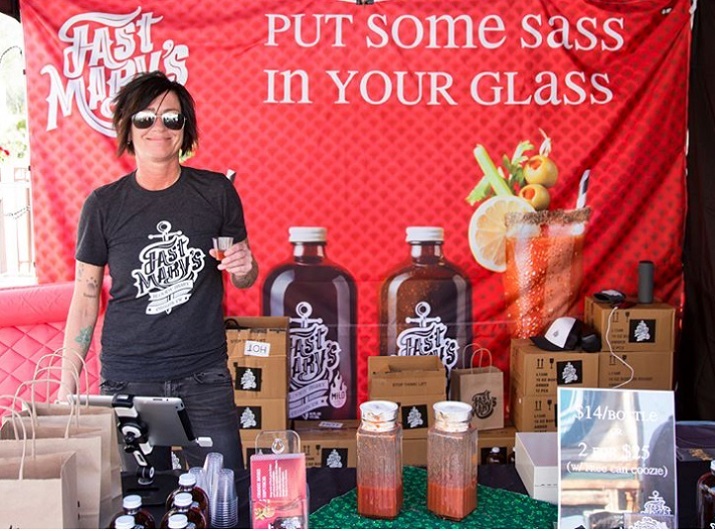 bottles of Fast Mary’s Bloody Mary Enhancer (hot and mild) and a logo cocktail glass. I bartended while I was in college and making Bloody Mary’s was one of the more time-consuming drinks to make. I needed a more efficient way to make multiple Bloody Mary’s, and that’s when I came up with Fast Mary’s. It contains all the seasonings we enjoy in a Bloody Mary and can simply be added to a tomato base to create the perfect Bloody Mary. After college, I worked in the corporate world, but was able to perfect the formulation for both Fast Mary’s hot and mild blends. I took the leap and started doing Fast Mary’s full-time in 2017. What do your customers love most about your product? People are drawn to Fast Mary's branding and packaging, and I think they’re initially surprised at how good the taste is in just plain tomato juice. Customers appreciate that they’re able to customize their Bloody Mary to their specific taste. Many people also use Fast Mary’s as a seasoning mix for meat/vegetable marinades, chili seasoning, and eggs. There are endless possibilities!! I believe I was destined to be an inventor. As a kid, I remember getting a microscope for a gift and was obsessed with it. Whether corporate-related inventions or Fast Mary’s Bloody Mary Enhancer, I’ve never stopped thinking of new things to create. Check out more about Wendi's product online, and be sure to stop by her booth at the Minneapolis Gift & Art Expo, November 2-4, 2018 at the Minneapolis Convention Center!